It has been raining on and off for four straight days now in most parts of the state. This morning weather radio reported up to 6″ of rain in some areas on the coast and up to 4″ inland. For the golfers, at least this hasn’t been snow. That would definitely delay golf season for a few weeks. The rain has brought some heightened concern to some areas on the golf course that otherwise would never cross the mind. Drainage for one is definitely being assessed on both courses, but mainly the North. The pond level on 4 North is so high, in order to get to the green one would need to walk up to the tee on 5 and back down the hill. The front right bunker and the approach are completely submerged. The river level that runs parallel to 10 North has flooded the tee complex and the front portion of 9 North green. 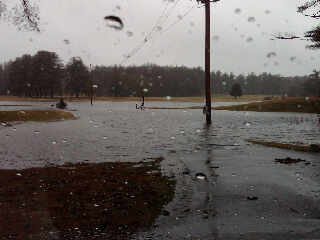 There is the usual spring rain pond in front of 17 North green and another rain pond in between 4 and 5 North fairways. The culvert under Randall Rd. is having a very tough time keeping up with the water volume and has started to partially malfunction. Holes 2 and 4 South are very wet as well. Fortunately, all of this rain has washed away all of the remaining snow on the South course, allowing us to open all 18 greens for play tomorrow. However, hole 4 will still have a temporary tee because the fairway is still too wet. Walking only will be allowed tomorrow, but expect extremely wet conditions. 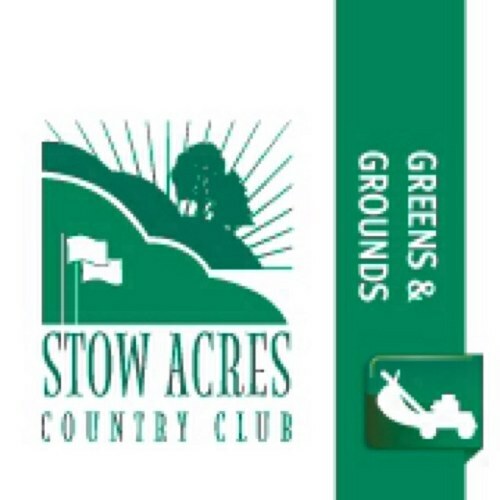 The greens will be very soft and the fairways will have very little to no roll at all. Some of the sand traps will be unplayable due to water, and we will start to pump those as soon as our pond level on 4 North is manageable. We have been pumping the pond in addition to our drain line for 9 hours a day for 6 days outputting approximately 500 gallons per minute. Hopefully with the sunny weather predicted for this week, we can catch up with the water and start to make improvements to the course. We hope to have the North ready to play by Friday. Thank you in advance for your patience! See you on the course! Water level on 10 North is so high, the tee is now an island. Picture taken March 14th.